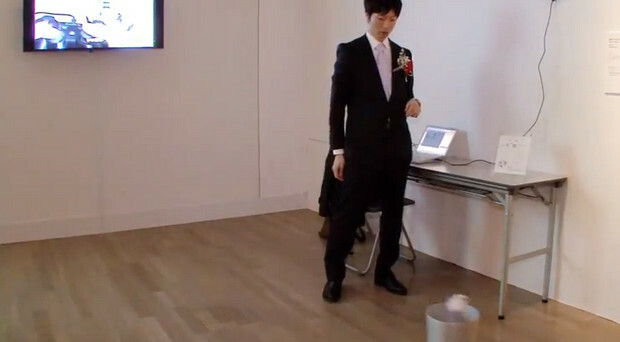 Brilliantly pointless, this Smart Trash Can from Japan will shuffle around an office floor to guarantee that any objects thrown at it will hit the target. Developed by automobile electronics engineer Minoru Kurata, the perambulating bin comes with a sensor that can detect the exact position of the incoming trash. This info is relayed to a computer which sends a wireless command to the bin to get moving to intercept the incoming rubbish. The motorised bin has already won an Excellence Award at the Japan Media Arts Festival, and Kurata is now looking to patent the technology. The trash can has to move autonomously. To achieve that, I created a special mechanism, with a single axis for both the wheel rotation and the change in angle. So even if the wheels rotate, the position of the can itself doesn’t change. 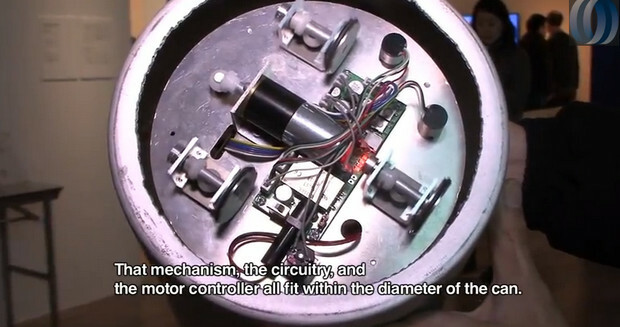 That mechanism, the circuitry, and the motor controller all fit within the diameter of the can. If the center of gravity is high, the can will fall over, so I made the can low, narrow, and compact, to keep the center of gravity as low as possible. The probability that the trash will go in is not very high, only 10-20%. Even making full use of the current sensor, it still has errors. So I’d like to improve the success rate. I want to either improve the sensor, or upgrade the control by reducing the error through a program. Or, conversely, office staff could just practice their aim with a conventional, fixed bin rather than using up the resources of a computer and motors to do it for them.